Aaron Roopnarine, left, Shazard Hosein, centre, and Sunil Roopnarine. 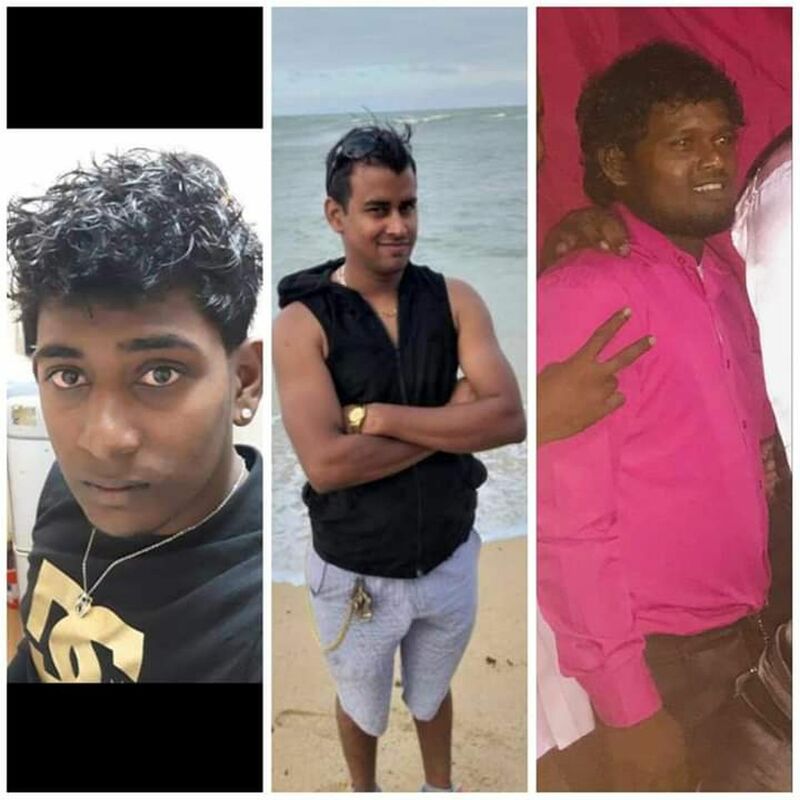 Ac­cord­ing to re­ports, Shaz­ard Ho­sein, 29, Aaron Roop­nar­ine, 19 and his broth­er Sunil Roop­nar­ine, 23 were at a par­lour in Uquire Road, Freeport when a car and a van pulled up around 4 pm. Two men armed with guns got out of the car and ran in­to the par­lour, de­mand­ing the shop­keep­er hand over cig­a­rettes and mon­ey. Ho­sein’s broth­er Rocky told Guardian Me­dia that the shop­keep­er hand­ed over car­tons of cig­a­rettes but told the men he did not have any mon­ey. The men took the cig­a­rettes and ran out. How­ev­er, they ran back in­to the par­lour less than a minute af­ter and asked which one of the men was Aaron. They then bun­dled the Roop­nar­ine broth­ers and Ho­sein in­to the car and sped off. Rocky said a re­port was made to the Freeport Po­lice Sta­tion but up un­til press time, no ran­som was de­mand­ed. Sunil is the fa­ther of three young chil­dren while Ho­sein is en­gaged to be mar­ried. Rocky said the three were tak­ing part in Phag­wa cel­e­bra­tions in the com­mu­ni­ty and had been pitch­ing mar­bles with chil­dren min­utes be­fore the in­ci­dent. He sent out an emo­tion­al plea for his broth­er’s safe re­turn. “Who­ev­er has him please let him come home safe­ly, he is not in­volved in any­thing with any­body – any­one in the pub­lic can come in­to our vil­lage and ask about these boys, they are very good peo­ple,” he said. Any­one with in­for­ma­tion on the where­abouts of the men is be­ing asked to con­tact the Freeport Po­lice Sta­tion at 673-0027 or the near­est po­lice sta­tion.